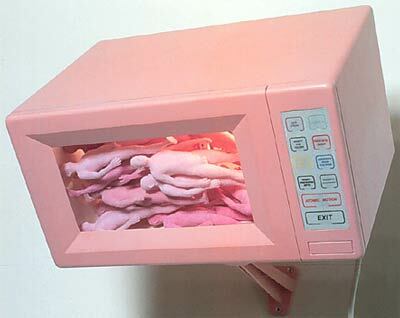 Being a keen adopter of new gadgets, I was quick to embrace microwave cooking way back as the 80s. Admittedly, the food didn’t taste as good, but this seemed a small price to pay for speed and convenience. I even remember once taking a microwave away on holiday, because back then all you got in motels was “hot plates” and they seemed as primitive as finding some dry sticks and making a fire. Years later, when becoming sick gave me some motivation to start looking at health issues, I came across the odd mention of the destructive effects of microwaves on food. At the time it seemed like too much information, and as I was finding out that pretty much everything I did or ate was harmful to my health, that was one of the things I chose to ignore. Later, I started paying a lot more attention to health information, and stopped using microwaves in 1999. But I still thought it was really only protein that was badly affected by microwaves. Reading these articles was the final straw and was what ended microwave cooking for me. And it isn’t really all that difficult heating things on the stove. It looks a little strange taking a hot plate away on holiday, but these days cooking food in a microwave seems as insane to me as fluoridation, genetic modification, or globalisation, and I’ve certainly never eaten anything cooked in a microwave this century. Of course, if microwave ovens were really harmful, our government would never allow them on the market, would they? Would they? Regardless of what has been “officially” released concerning microwave ovens, we have personally stopped using ours based on the research facts outlined in this article. Take the example of eggs and how they were “proven” to be so harmful to our health in the late 1960’s. This brought about imitation egg products and big profits for the manufacturers, while egg farms went broke. Now, recent government sponsored studies are saying that eggs are not bad for us after all. So, whom should we believe and what criteria should we use to decide matters concerning our health? A number of warnings have been made public, but have been barely noticed. For example, Young Families, the Minnesota Extension Service of the University of Minnesota, published the following in 1989: “Although microwaves heat food quickly, they are not recommended for heating a baby’s bottle. The bottle may seem cool to the touch, but the liquid inside may become extremely hot and could burn the baby’s mouth and throat. Dr. Lita Lee of Hawaii reported in the December 9, 1989 Lancet: “Microwaving baby formulas converted certain trans-amino acids into their synthetic cis-isomers. Synthetic isomers, whether cis-amino acids or trans-fatty acids, are not biologically active. It’s very obvious that this form of microwave radiation “heating” does something to the substances it heats. It’s also becoming quite apparent that people who process food in a microwave oven are also ingesting these “unknowns”. Because the body is electrochemical in nature, any force that disrupts or changes human electrochemical events will affect the physiology of the body. This is further described in Robert O. Becker’s book, The Body Electric, and in Ellen Sugarman’s book, Warning, the Electricity Around You May Be Hazardous to Your Health. In Comparative Study of Food Prepared Conventionally and in the Microwave Oven, published by Raum & Zelt in 1992, at 3(2): 43, it states “A basic hypothesis of natural medicine states that the introduction into the human body of molecules and energies, to which it is not accustomed, is much more likely to cause harm than good. Microwaved food contains both molecules and energies not present in food cooked in the way humans have been cooking food since the discovery of fire. Microwave energy from the sun and other stars is direct current based. Artificially produced microwaves, including those in ovens, are produced from alternating current and force a billion or more polarity reversals per second in every food molecule they hit. Dr. Hertel was the first scientist to conceive and carry out a quality clinical study on the effects microwaved nutrients have on the blood and physiology of the human body. His small but well controlled study showed the degenerative force produced in microwave ovens and the food processed in them. The scientific conclusion showed that microwave cooking changed the nutrients in the food; and, changes took place in the participants’ blood that could cause deterioration in the human system. Hertel’s scientific study was done along with Dr. Bernard H. Blanc of the Swiss Federal Institute of Technology and the University Institute for Biochemistry. In intervals of two to five days, the volunteers in the study received one of the following food variants on an empty stomach: (1) raw milk; (2) the same milk conventionally cooked; (3) pasteurized milk; (4) the same raw milks cooked in a microwave oven; (5) raw vegetables from an organic farm; (6) the same vegetables cooked conventionally; (7) the same vegetables frozen and defrosted in a microwave oven; and (8) the same vegetables cooked in the microwave oven. Once the volunteers were isolated, blood samples were taken from every volunteer immediately before eating. Then, blood samples were taken at defined intervals after eating from the above milk or vegetable preparations. Significant changes were discovered in the blood samples from the intervals following the foods cooked in the microwave oven. These changes included a decrease in all hemoglobin and cholesterol values, especially the ratio of HDL (good cholesterol) and LDL (bad cholesterol) values. Lymphocytes (white blood cells) showed a more distinct short-term decrease following the intake of microwaved food than after the intake of all the other variants. Each of these indicators pointed to degeneration. Additionally, there was a highly significant association between the amount of microwave energy in the test foods and the luminous power of luminescent bacteria exposed to serum from test persons who ate that food. According to Dr. Hertel, “Leukocytosis, which cannot be accounted for by normal daily deviations, is taken very seriously by hemotologists. 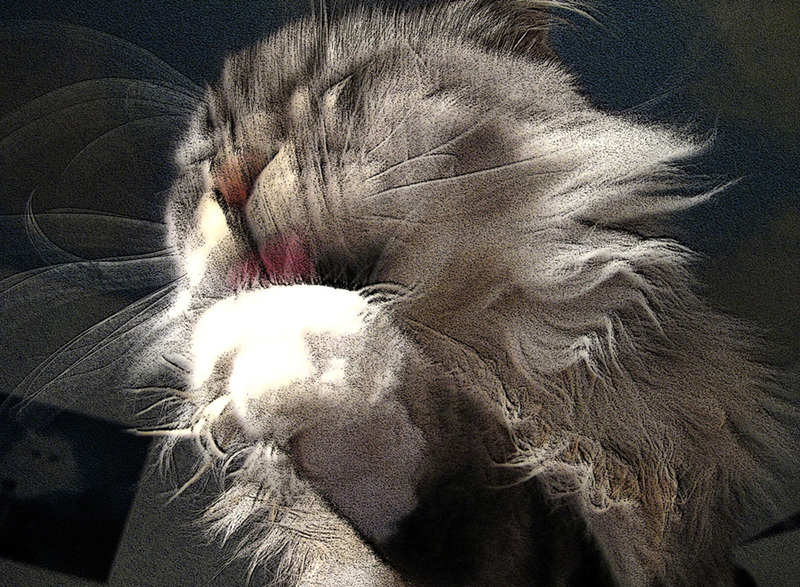 Leukocytes are often signs of pathogenic effects on the living system, such as poisoning and cell damage. The increase of leukocytes with the microwaved foods were more pronounced than with all the other variants. It appears that these marked increases were caused entirely by ingesting the microwaved substances. This process is based on physical principles and has already been confirmed in the literature. The apparent additional energy exhibited by the luminescent bacteria was merely an extra confirmation. Technically produced microwaves are based on the principle of alternating current. Atoms, molecules, and cells hit by this hard electromagnetic radiation are forced to reverse polarity 1-100 billion times a second. There are no atoms, molecules or cells of any organic system able to withstand such a violent, destructive power for any extended period of time, not even in the low energy range of milliwatts. Of all the natural substances – which are polar – the oxygen of water molecules reacts most sensitively. 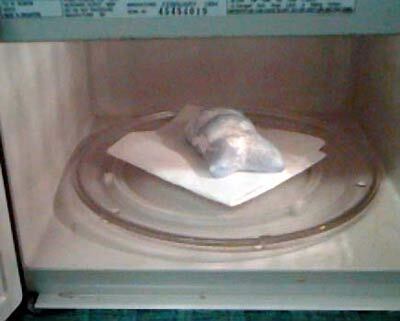 This is how microwave cooking heat is generated – friction from this violence in water molecules. Structures of molecules are torn apart, molecules are forcefully deformed, called structural isomerism, and thus become impaired in quality. This is contrary to conventional heating of food where heat transfers convectionally from without to within. The same violent deformations that occur in our bodies, when we are directly exposed to radar or microwaves, also occur in the molecules of foods cooked in a microwave oven. This radiation results in the destruction and deformation of food molecules. Microwaving also creates new compounds, called radiolytic compounds, which are unknown fusions not found in nature. Radiolytic compounds are created by molecular decomposition – decay – as a direct result of radiation. Microwave oven manufacturers insist that microwaved and irradiated foods do not have any significantly higher radiolytic compounds than do broiled, baked or other conventionally cooked foods. The scientific clinical evidence presented here has shown that this is simply a lie. In America, neither universities nor the federal government have conducted any tests concerning the effects on our bodies from eating microwaved foods. Isn’t that a bit odd? They’re more concerned with studies on what happens if the door on a microwave oven doesn’t close properly. Once again, common sense tells us that their attention should be centered on what happens to food cooked inside a microwave oven. Since people ingest this altered food, shouldn’t there be concern for how the same decayed molecules will affect our own human biological cell structure? As soon as Doctors Hertel and Blanc published their results, the authorities reacted. A powerful trade organization, the Swiss Association of Dealers for Electro-apparatuses for Households and Industry, known as FEA, struck swiftly in 1992. They forced the President of the Court of Seftigen, Canton of Bern, to issue a “gag order” against Drs. Hertel and Blanc. In March 1993, Dr. Hertel was convicted for “interfering with commerce” and prohibited from further publishing his results. However, Dr. Hertel stood his ground and fought this decision over the years. Not long ago, this decision was reversed in a judgment delivered in Strasbourg, Austria, on August 25, 1998. The European Court of Human Rights held that there had been a violation of Hertel’s rights in the 1993 decision. The European Court of Human Rights also ruled that the “gag order” issued by the Swiss court in 1992 against Dr. Hertel, prohibiting him from declaring that microwave ovens are dangerous to human health, was contrary to the right to freedom of expression. In addition, Switzerland was ordered to pay Dr. Hertel compensation. Various kinds of damage to many plant substances, such as alkaloids, glucosides, galactosides and nitrilosides. In Robert O. Becker’s book, The Body Electric, he described Russian research on the health effects of microwave radiation, which they called “microwave sickness.” On page 314, Becker states: “It’s [Microwave sickness] first signs are low blood pressure and slow pulse. The later and most common manifestations are chronic excitation of the sympathetic nervous system [stress syndrome] and high blood pressure. At www.pcola.gulf.net/~irving/bunnies/nuke.html we found experimental pictures showing that the only foodstuff unsuitable for heating in a microwave is marshmallow bunnies (see text below). These research scientists later went on to find that there is no causal link between research outcomes and scientific funding, finally proving conclusively that all scientific research is 100% reliable so long as it has been funded by commercial interests. Radiation Tolerance: Subjects grew up to 3-4 times it’s original size, mostly proportional to original dimensions. Subjects appeared to mutate as a result of the radiation bombardmants into much larger, more dangerous entities than originally. This concern of danger was alleviated, however, soon after the test chamber door was opened for observation. Further tests are not advised without the safety of a hungry researcher ready to eat the subjects before they can do any harm to themselves or their surroundings. Pieces of chocolate and wafers may be necessary to contain the subjects in their mutated states. A few Control Bunnies attempted to contact the ASPCA, but were quickly thwarted by their inability to dial a phone because of their light weight. A Volunteer Bunny was chosen at random and devoured on site to remind others of their commitments. Control Bunnies were otherwise unaffected.